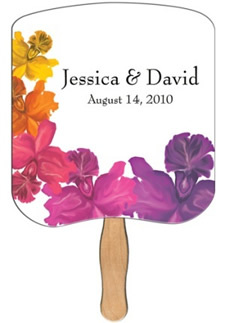 Wedding hand fans are a popular item for church and outdoor weddings, especially when used as a wedding program. Print your wedding program directly onto any of these wedding hand fans in full color on both the front and the back of the hand fan. Prices for all wedding fans includes your custom imprint in full color on both sides, then film laminated on both sides for extra durability. 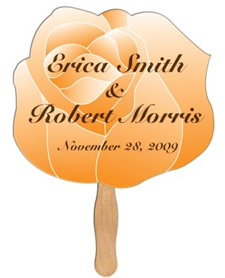 We now offer two types of handles on our Wedding Hand Fans: wooden handles or plastic handles. Wooden sticks are glued (not stapled) to fan back for safety and appearance. Non-refundable set-up charge is $35. An additional $45 charge for photographs. Additional charges apply if art work is complex. 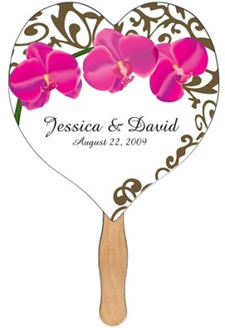 Heart Wedding Hand Fan available with either stock floral graphic or fully customizable in templates. Floral Breadslice wedding fan template is available with floral design or fully customizable for your own artwork design. 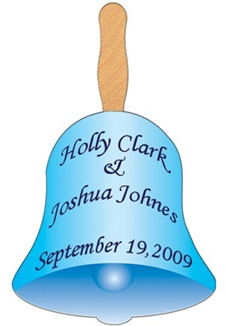 Bell Wedding Fan is available with stock bell graphics as shown or fully customizable in template. Wooden stick can be glued on either top or bottom of the bell. Flower Wedding Fan template available with rose graphic or fully customizable to your own artwork. Price includes a custom imprint in full color on both sides. 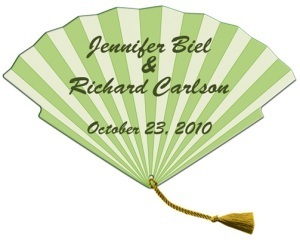 These wedding fans are then film laminated on both sides for extra durability. You can use the striped template in designing your Tassel Wedding Fan or it can be completely customized. 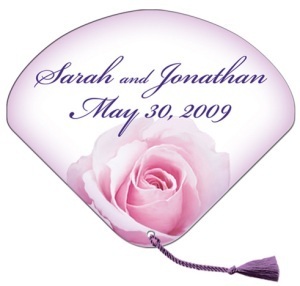 The rose template is available on the Seashell Wedding Fan or you can use your custom design. Contact us 706-374-0710 for other fan templates if desired. 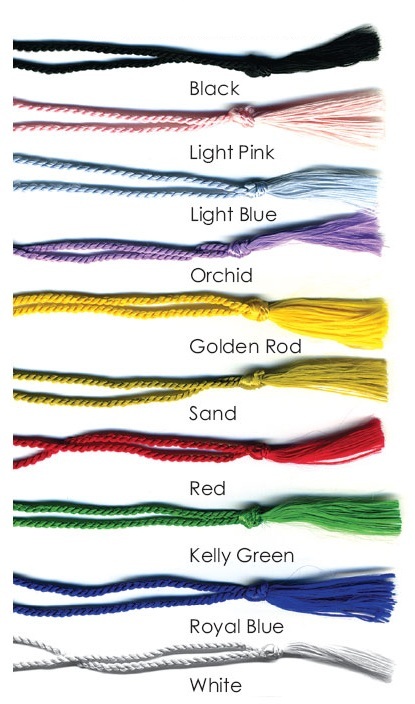 Wedding fans with tassels includes tassel in choice of 10 colors: Black, Light Pink, Light Blue, Orchid, Golden Rod, Sand, Red, Kelly Green, Royal Blue, White. 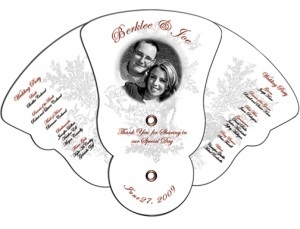 Another option for printing your wedding program or bridal party listing is our expandable wedding fans. These wedding fans are unique multi-piece fans that are great keepsakes for weddings. Expandable wedding fans are made of 22 point high density white poster board and liquid laminated for a high gloss finish. The expandable fan allows you to convey your custom message four ways! Fan grommets allow the panels to slide together for a one panel look. Price includes full color digital imprint on front and back center panel only. 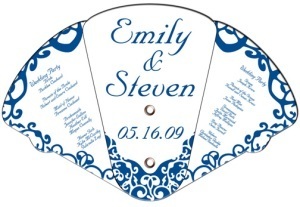 Many templates are available for custom printing your wedding fan. Contact us (706-374-0710) for assistance in selecting the best template for your wedding. Non-refundable artwork charge of $35 must be paid before work can begin. If printing photograph, there is an additional $45 charge. Additional setup charges apply if artwork is complex and cannot be provided. Please Note: Above prices are for 1-side imprint only. Contact us for additional charges for a 2-side imprint.